HomeThe perfect fall recipe….. in the summer? The perfect fall recipe….. in the summer? If you are like me, you get really frustrated at people who don’t think they can eat certain things because it is “out of season” ummmmm, last time I checked, if the grocery store carried it, I could eat it! The new obsession in my household over the past week has been a roasted squash soup with pork “croutons.” Yes, pork croutons. 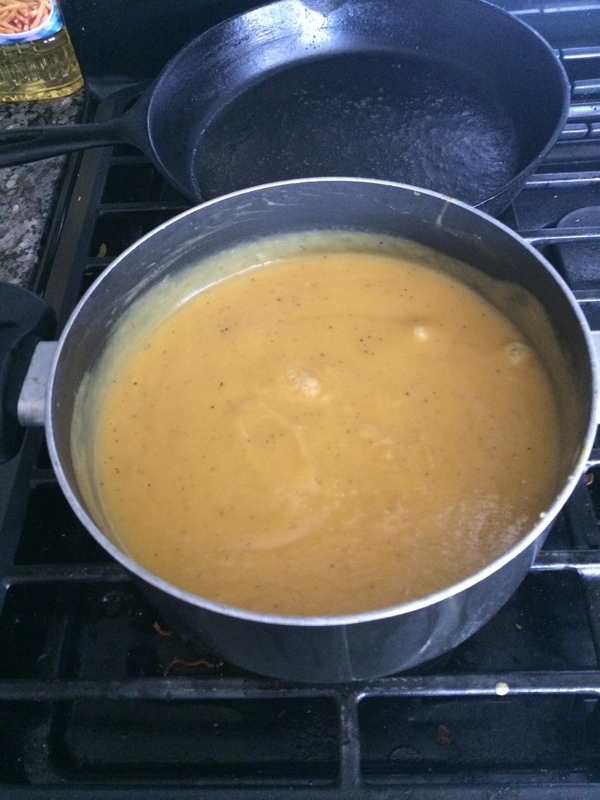 So how did I end up making a creamy squash soup in the middle of summer (and mind you, I live in Las Vegas so summer here is HOT)? My fiance and I LOVE roasted squash, we will take an acorn squash, halve it, clean it throw a few tablespoons of butter into the middle of it along with some salt and chili powder throw it in the oven and just let it roast for a while. The other day, I was going through our kitchen and figuring out what vegetables we had to make soon because they were about to go bad. Sitting on the counter was a large acorn squash. We had just had squash the night before, but I knew that if we waited much longer that we would have to trash the second squash we had bought. 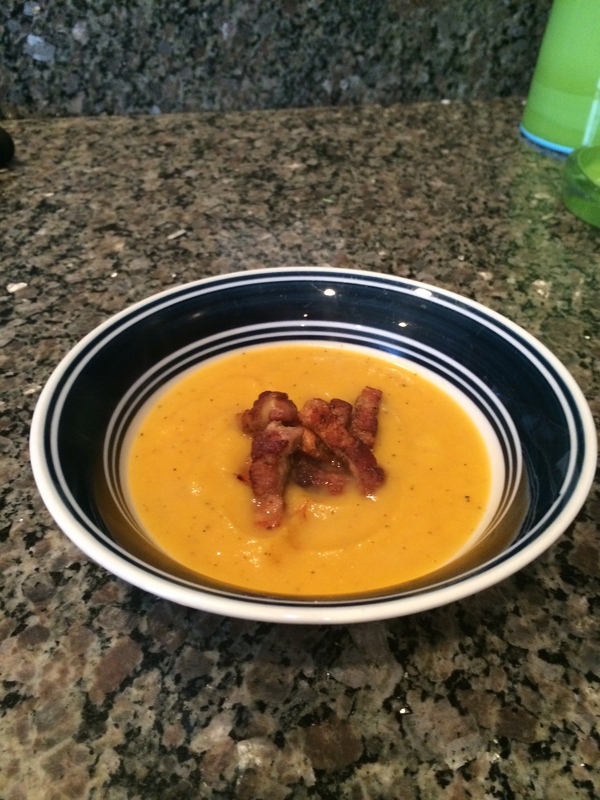 One thing I knew my fiance LOVES is soup (let’s be honest, who doesn’t love a good soup?). So I figured it would be a good use of the squash and would probably get eaten quickly in our house. The other upside to making a creamy squash soup, my finace is lactose intolerant, which basically means he can not digest dairy (milk or butter are the main things you have to watch for). Because of his condition he can’t really have creamy soups without having to take pills, powders or drops of some kind. It gets a little annoying and expensive for the medications he needs to be able to eat dairy. If you look up squash soup recipes, you see a lot of recipes that include a lot of ingredients, including butter and cream, about 10 different herbs and seasonings and it just seemed way over complicated and like it would not highlight the main ingredient, squash. So, being me, I said f*ck the recipes, I am going to make this up as I go! So that is what I did! First, I said screw using butter or cream! Who needs them? Squash is so creamy on its own if you cook it properly that it seemed ridiculous to add more. So I kept it simple, I sliced up the squash, leaving the skin on put it on a baking sheet with a little olive oil (I didn’t season it at this point) and put it in the oven to roast until it was extremely soft. I then rough chopped some onion and garlic (it is going to be blended so I wasn’t worried about dicing perfect onions and garlic here.) I put those into my soup pot and let them begin to break down and caramelize. What I like about not using recipes and making my own is that I don’t worry about cooking things exactly like the recipe said, the first time I made the soup I cooked the onions only until translucent, the second time (which happened about 5 seconds before beginning this post!) I cooked them down a lot more for better flavor. I used half an onion, but again being as it is your recipe and your preferences add some more if you like onion more or less if you don’t! Once my squash, onions and garlic were all cooked to my liking, it was time to blend! If you have a professional grade blender, your life is going to be easy doing this. If you don’t, it’s going to be a stop and go process most likely. I have an okayish blender so I have to stop and go a bit. Depending on how much you are making you may also need to do several batches in the blender and then mix together in a pot. Or you may have a hand blender that would work just as well. The blending is easy (kind of), I put my squash and onions in first and then I put in a little bit of broth (you can use veggie or chicken but I would avoid beef for this). I start the blend process and slowly add the broth until it is as thin or thick as you want, then just let it blend for a while to really get it creamy (plus no one likes lumpy soup!). Once you have the consistency that you like you can add the herbs or seasoning you like. I like to keep it really simple and just do some salt and pepper and since my fiance LOVES heat in his food, I also do some chili powder or cayenne so that he gets the heat he likes. Now, squash is kind of sweet and if you are like me, you like balanced flavors. So I like to add a salty element to the meal when I have soup. I like pork croutons! 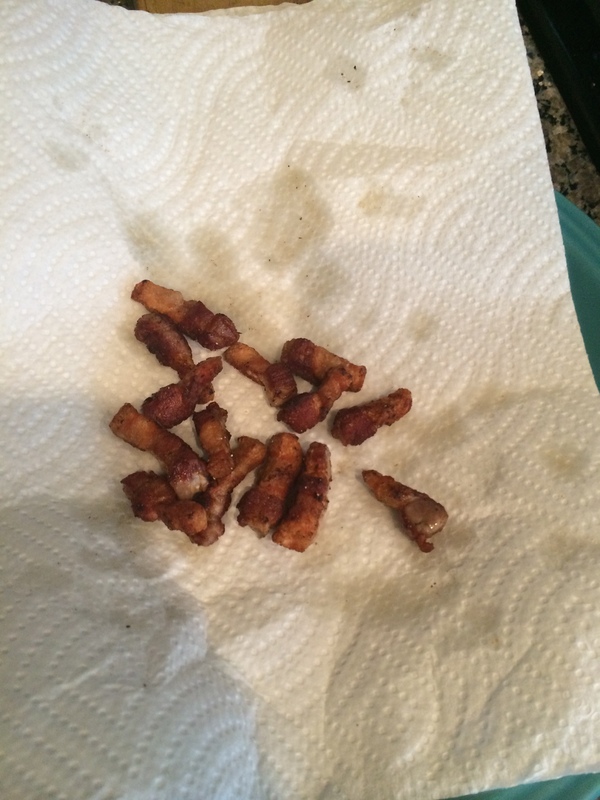 Now, this may sound weird to some of you who have never heard of a pork crouton, but all it is is pork belly that has been cut into about half inch pieces that is rendered and crisped up. You could go the simple route and use bacon, but I prefer the pork belly route because, it’s pork belly, it’s yummy. Really easy to make, cube up your pork belly to the size you like it. I like to keep it bite size when I pair it with a soup (who wants to use a knife when they are eating soup?). 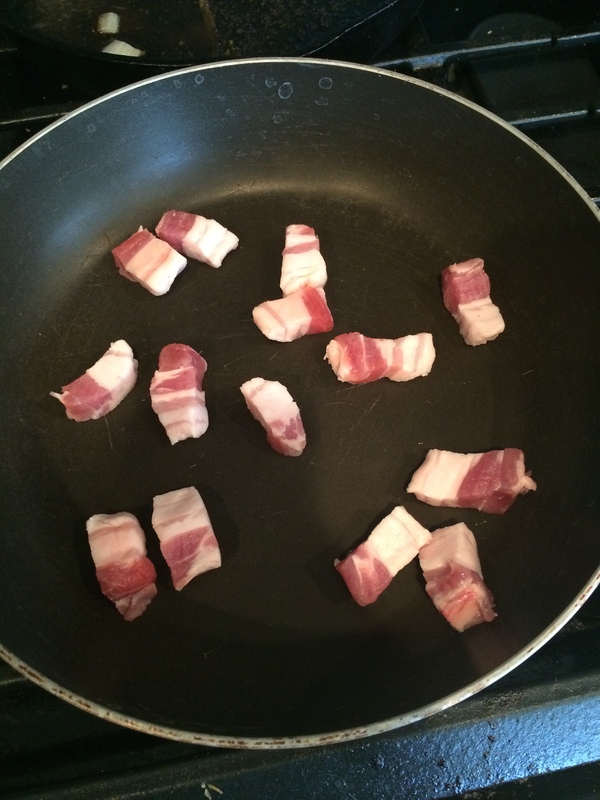 Once you have them cubed, cook it just like you would bacon, add a little salt, a little pepper and then you put it in a skillet in a single layer and let it brown and let the fat render. I think the main thing people do is play with the food they want to sear off, so LEAVE IT ALONE!!!! No, really don’t even touch the pan for about 3-5 minutes. Then just like before, leave it alone and let the other side brown. After another few minutes you can toss the pork belly around a bit so you get the sides browned as well. Once it is fully cooked, put the pork on a paper towel lined plate to drain the excess fat. put your soup into a bowl and place your pork croutons in the middle of the soup and Enjoy!!!! Cook your veggies down, typically I roast my squash for better flavor, but you can also cut it up small and cook it on the stove top. caramelize your onions and garlic. Put squash, onions, garlic in blender with a little bit of broth and start the blender, slowly add broth until blended smooth and you reach the consistency that you like. Let blender run as you add seasonings you like so they combine nicely. Pour this from blender back into a soup pot and let it simmer for a while to develop the flavors. Cube the pork belly into bite size pieces (about 1/2 inch) salt and pepper pork belly and place in skillet on stove top. Let brown for 3-5 minutes DO NOT TOUCH IT. Let it brown and then flip it over and let the other side brown as well. 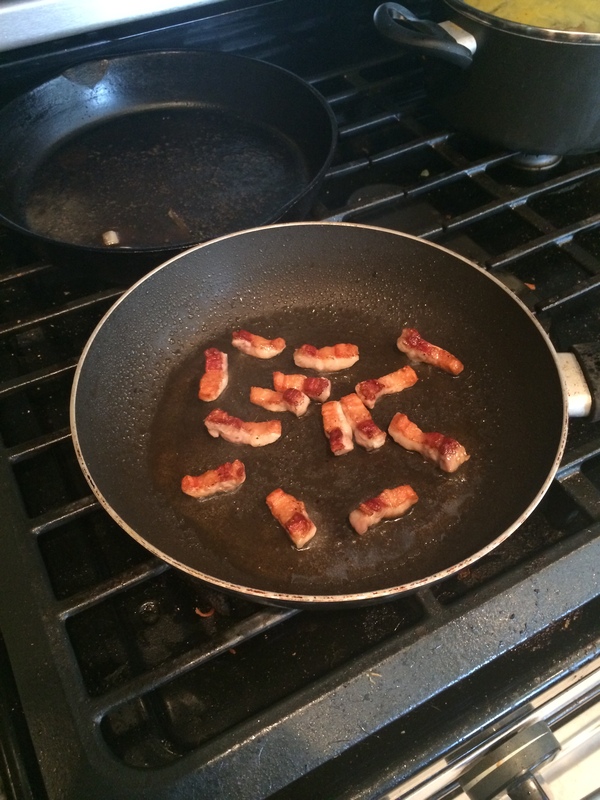 Remove from skillet and place on paper towel lined plate to drain excess fat off of it. I hope the freedom this recipe provides anyone who tries it shows you how silly it is to follow recipes exactly sometimes. This is an easy, simple and delicious recipe that if I had followed from a website would have included about 10 more ingredients. Food isn’t complicated or difficult if you stop worrying about following the recipe. This is so basic you could make it even more tailored to your specific tastes. You could add roasted red peppers to this, you could add carrots but you will never know if you don’t try it. ← How NOT to make a tres leches cake….